The Internal Revenue Service (the “IRS”) has announced the annual cost-of-living adjustments applicable to dollar limitations for retirement plans and other items for Tax Year 2016. The retirement plan limitations generally are unchanged in 2016 because in most cases the slight increase in the cost-of-living index did not meet the statutory thresholds that trigger rate adjustments. The following is a list of the key dollar limitations which have not changed. Additional information on the 2016 limitations can be found in IRS Notice 2015-75. 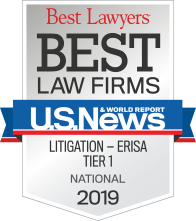 The annual compensation limit remains unchanged at $265,000 (Code sections 401(a)(17), 404(l),408(k)(3)(C), and 408(k)(6)(D)(ii)). The limitation on the annual benefit under a defined benefit plan remains unchanged at $210,000 (Code section 415(b)(1)(A)). 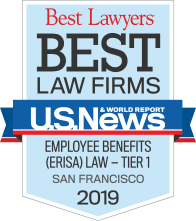 The compensation amounts used in defining “control employee” for fringe benefit valuation for Board or shareholder-appointed, confirmed, or elected officers of the employer remains unchanged at $105,000. The compensation amount used for all other employees of the employer remains unchanged at $215,000 (Reg. sections 1.61–21(f)(5)(i) and 1.61–21(f)(5)(iii)). The limitation for defined contribution plans remains unchanged at $53,000 (Code section 415(c)(1)(A)). 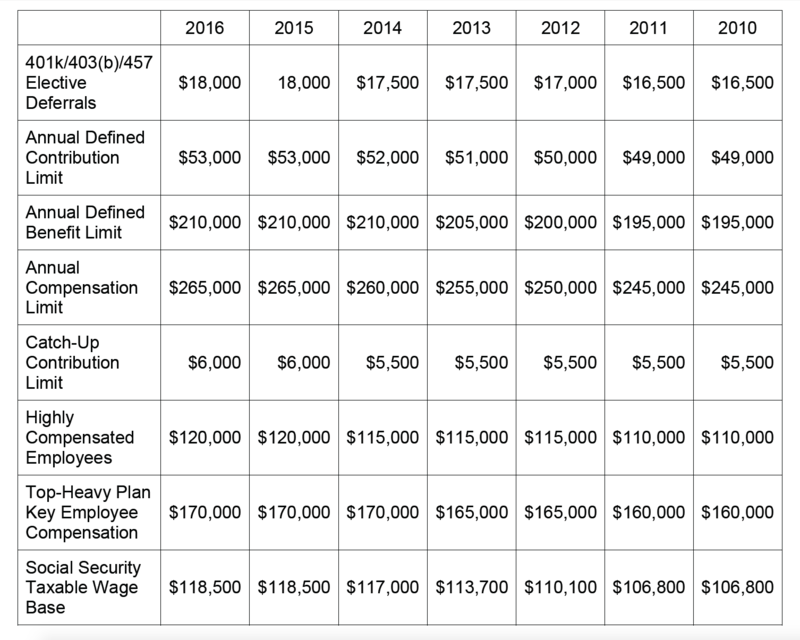 The maximum amount of elective deferrals that may be made to 401(k) plans, 403(b) plans, simplified employee pensions (“SEPs”), and 457(b) plans remains unchanged at $18,000 (Code sections 402(g)(1) and 457(e)(15)). The maximum amount of catch-up contributions that individuals aged 50 or over may make to 401(k) plans, 403(b) plans, SEPs, and governmental 457(b) plans remains unchanged at $6,000 (Code section 414(v)(2)(B)(i)). The maximum amount of catch-up contributions that individuals aged 50 or over may make to SIMPLE 401(k) Plans or SIMPLE Retirement Accounts remains unchanged at $3,000 (Code section 414(v)(2)(B)(ii)). The limitation used in the definition of highly compensated employee remains unchanged at $120,000 (Code section 414(q)(1)(B)). The compensation amount used for determining required participation in SEPs remains unchanged at $600 (Code section 408(k)(2)(C)). The limitation on the exclusion for elective deferrals to SIMPLE retirement accounts remains unchanged at $12,500 (Code section 408(p)(2)(E)). The deductible amount for an individual making qualified retirement contributions remains unchanged at $5,500 (Code section 219(b)(5)(A)). The dollar limitation used for the definition of key employee in a top-heavy plan remains unchanged at $170,000. (Code section 416(i)(1)(A)(i)). The dollar amount for determining the maximum account balance in an employee stock ownership plan subject to a 5-year distribution period remains unchanged at $1,070,000, while the dollar amount used to determine the lengthening of the 5-year distribution period remains unchanged at $210,000 (Code section 409(o)(1)(C)(ii)). The annual compensation limitation for eligible participants in certain governmental plans that, under the plan as in effect on July 1, 1993, allowed cost-of-living adjustments to the compensation limitation under the plan to be taken into account, remains unchanged at $395,000 (Code section 401(a)(17)). The monthly limitation regarding the fringe benefit exclusion amount for transportation in a commuter highway vehicle and any transit pass remains unchanged at $130. (Code section 132(f)(2)(A)).